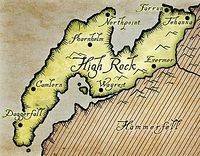 Jehanna, also spelled Jehenna or Jelhana, is a major city of northeastern High Rock, and one of High Rock's eight kingdoms. The city was invaded by the Nords during the War of the Bend'r-mahk in 3E 397, who seized large tracts of land that had belonged to High Rock and Hammerfell, claiming that they were once traditionally kingdoms of Skyrim. It is mentioned in the popular series of novels A Dance in Fire as the home of a disgruntled Nordic diplomat who was sent to Valenwood. 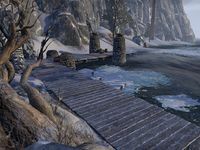 In 2E 582, a jetty bearing the name Jehanna Docks was situated in a similar location on the coast of northern Wrothgar. The 'Jehanna road' is also the name of the road leading from Bangkorai to Wrothgar. Given that the War of the Bend'r-mahk was instigated in order to reclaim "old kingdoms" of Skyrim, it is plausible that there were once earlier Nordic settlements in the region, which would predate the jetty that was present in the Second Era.